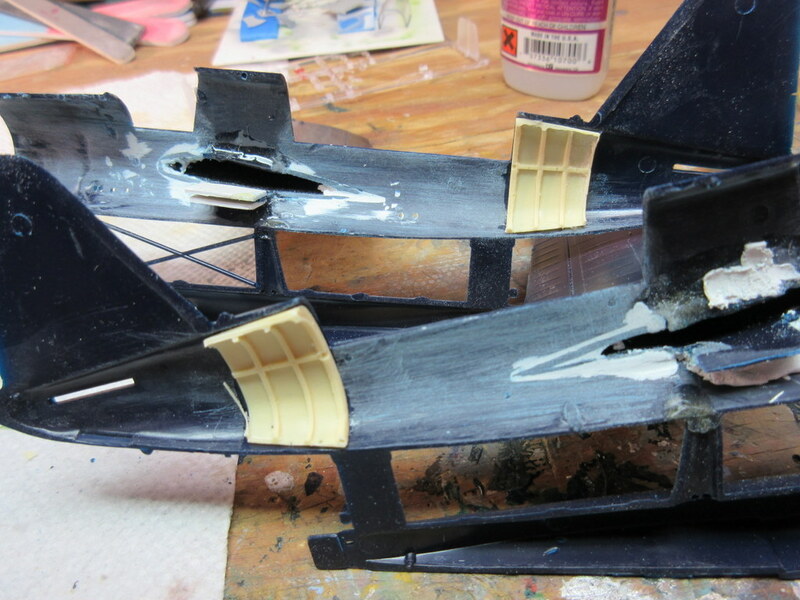 The simultaneous build of two kits continues with joint cockpit painting. 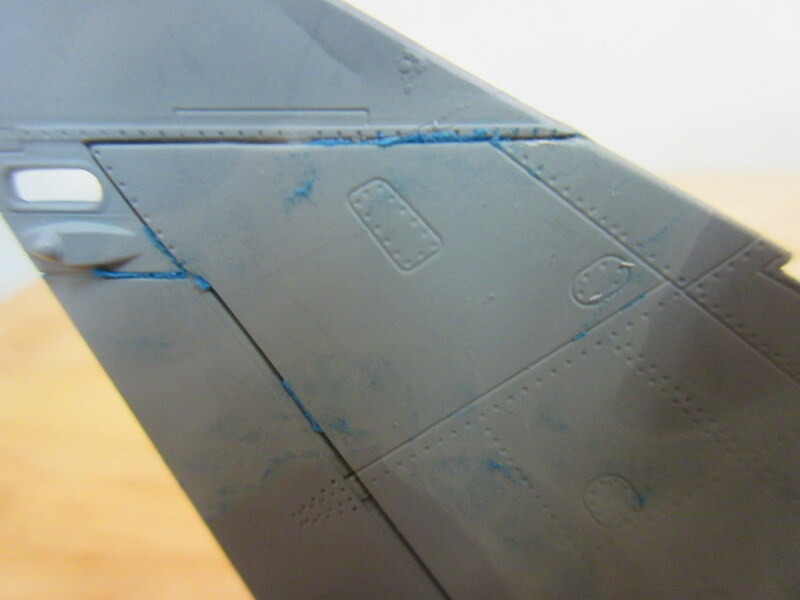 Both kits, a Monogram kingfisher, and a ProModeler F4U-5N, have about the same colors so I am creating them together, like painting one big cockpit. When I do cockpits I use a ton of colors. 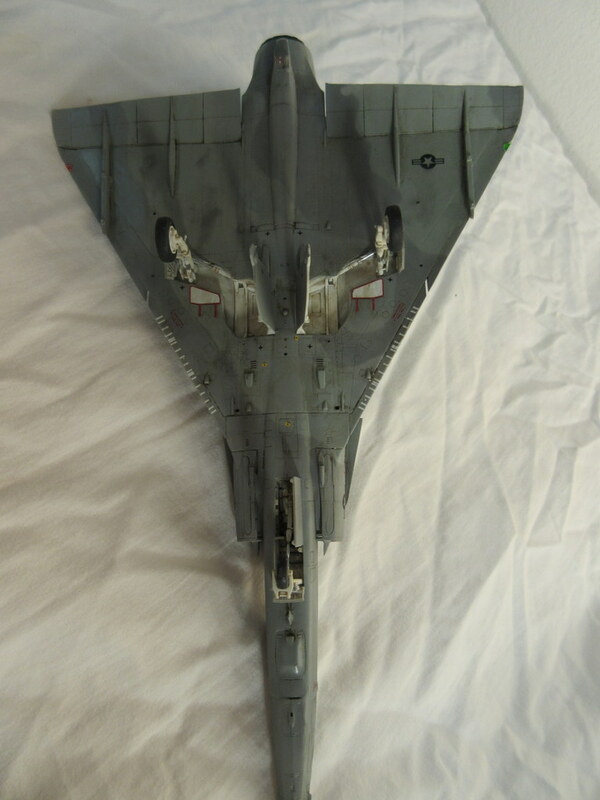 This tries to break up a monotone interior greens into some subtle variation that add eye candy to an otherwise drab hole in the aircraft. Might not be extreemly factual but it looks good to me. 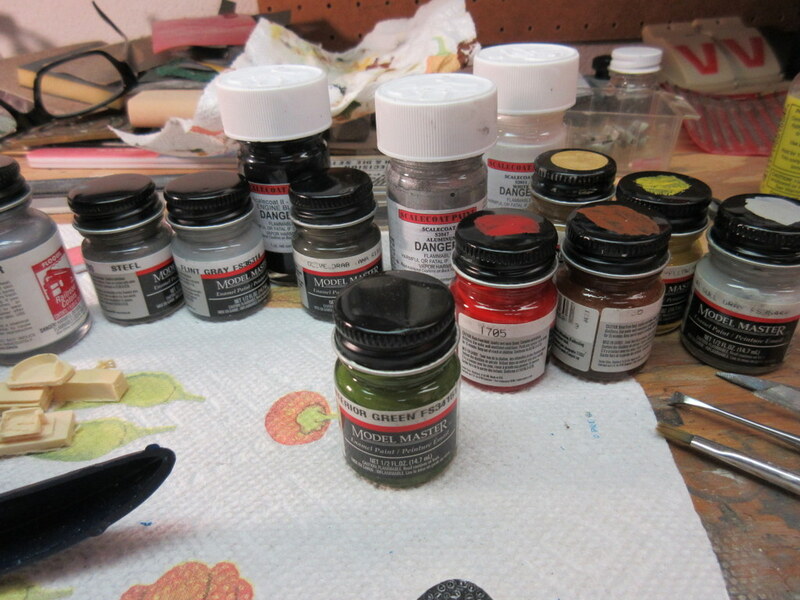 The thing that gets me is all of the colors I use, from all different brands. The F4U cockpit is a true details set. 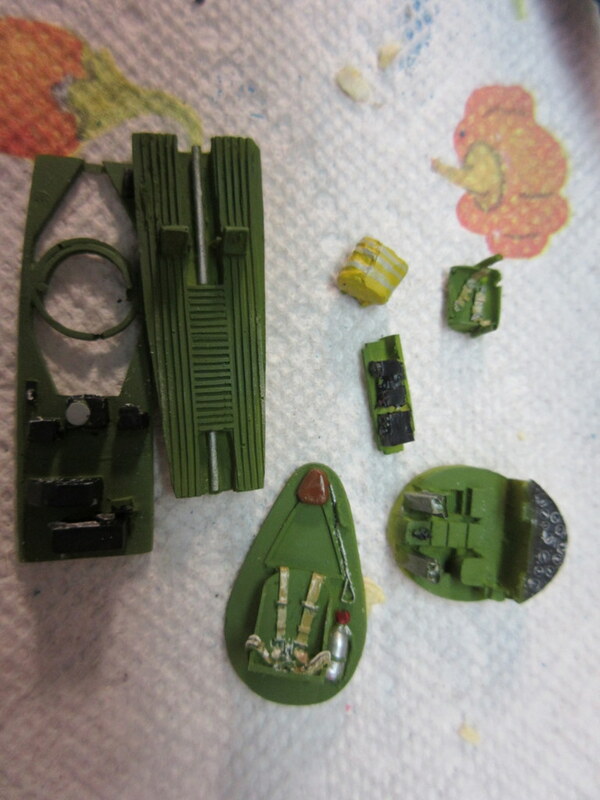 I’ve had to be careful because I skipped the step where you wash the resin mold release off and I’ve had a few bits of paint flak off that will need repair later. I haven’t painted the instruments yet because the ProModeler kit comes with a nice set of instrument decals that I will work with later. 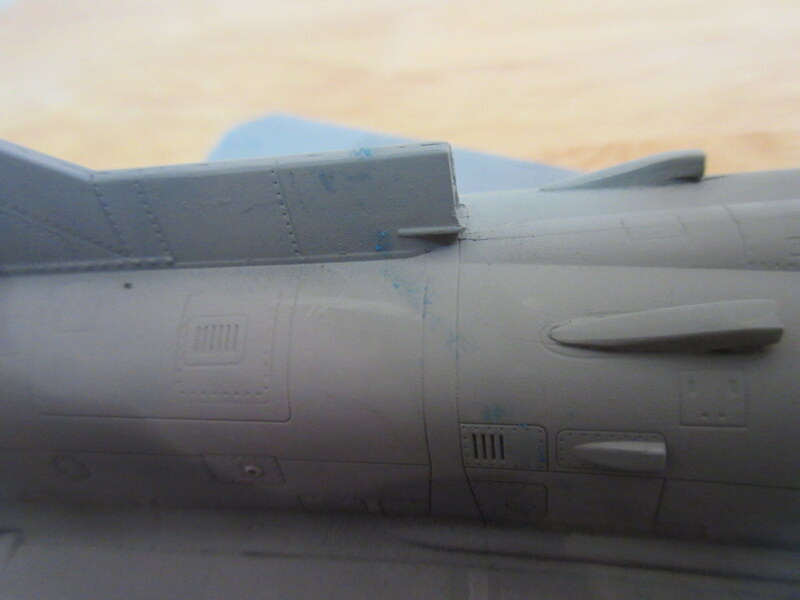 The Kingfisher is so wide open that I’ve had a lot of painting inside the open cockpit. The Lone Star cockpit set is pretty good and I’ve been slowly working it along a little dab of color at a time. 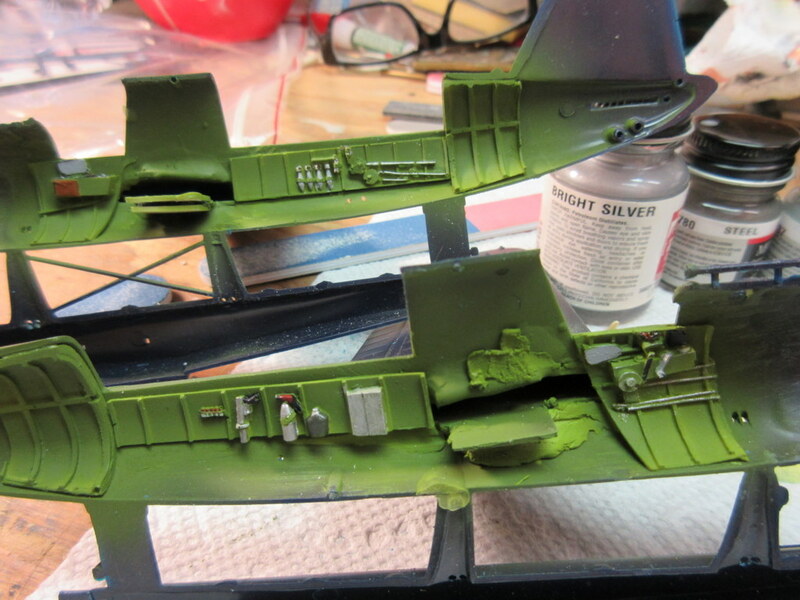 Both cockpit should be ready for a wash and highlighting tomorrow. I think once they are done the building part should go pretty quick. These two are my two March kits and I am a bit behind my goal of two per month. 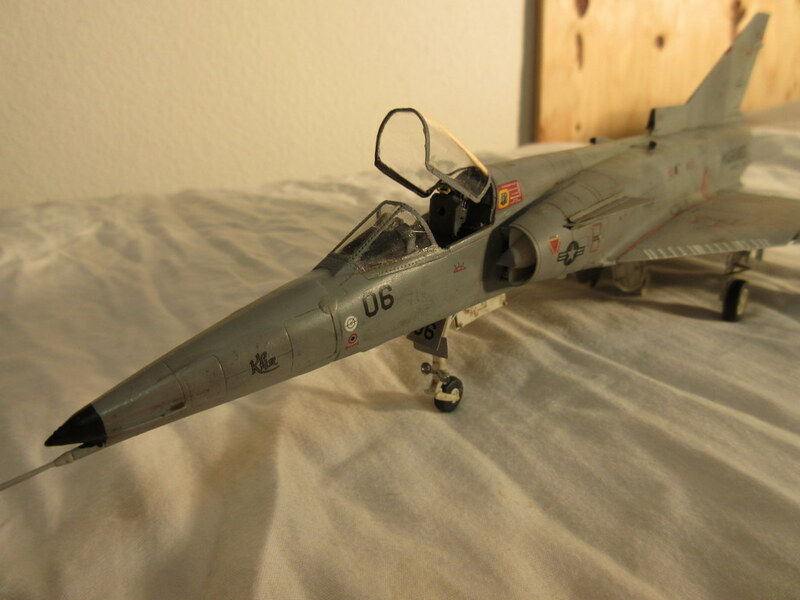 And just a last note; I’ve had this Kingfisher kit since longer than I can remember. The fact Lone Star made a cockpit for it finally inspired me to do it. And yesterday I read the announcement of a new tool Kingfisher due out later this year. Oh well, ya pays your money…. Build #4 for the year is done. I guess I’m a bit behind my two per month goal but then it’s only a hobby. 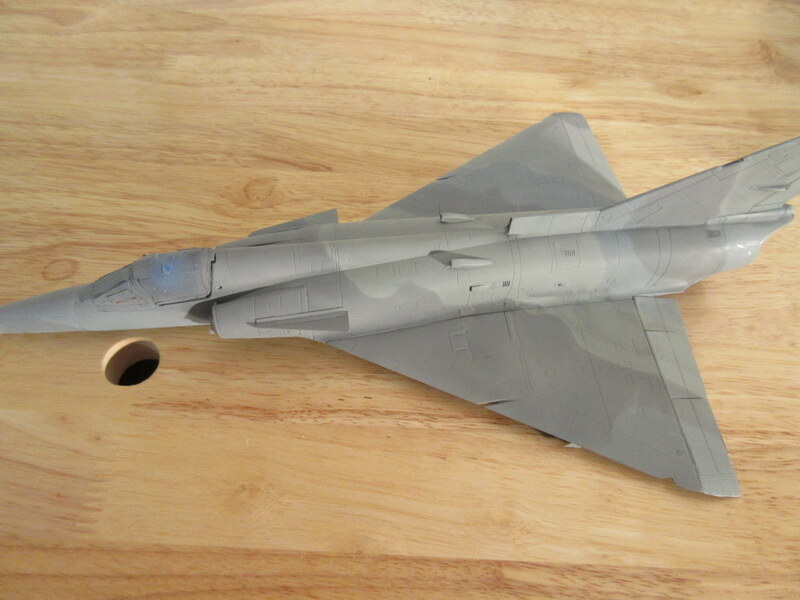 I’ll make it up with a couple of 1/72 scale kit I have in the queue. Overall a fun kit to build. 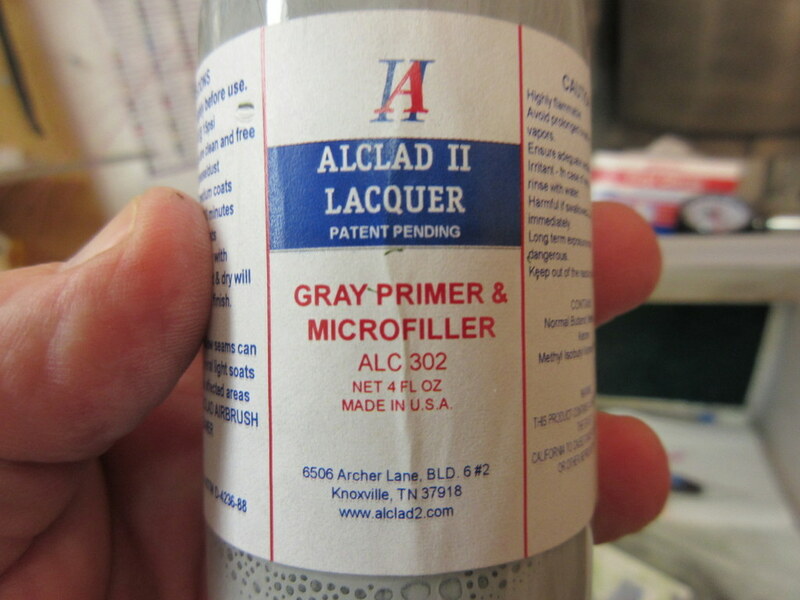 I’d like to thank my lovely bride for the kit for Christmas! I think this is the earliest I have built one of here gifts after receiving it as opposed to popping it on the stash pile. 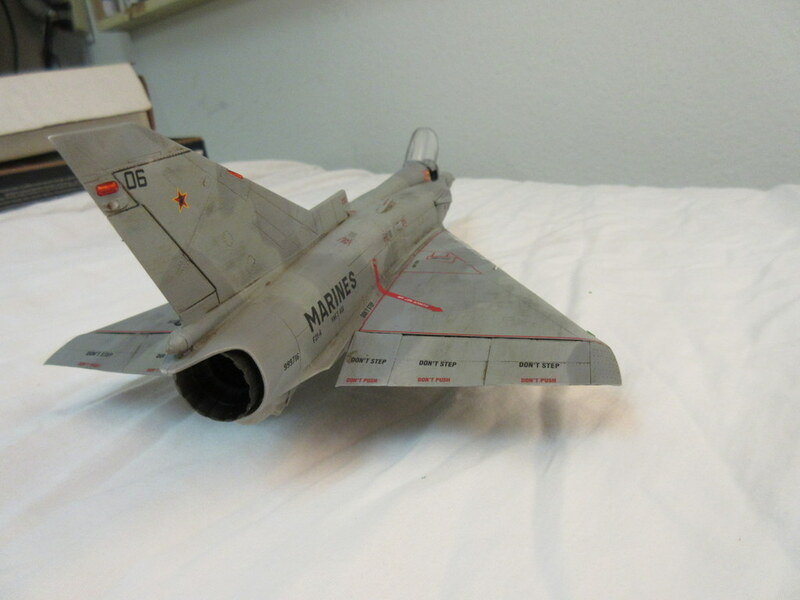 I had been looking to build a 1/48 scale version of this aircraft (my favorite scale). 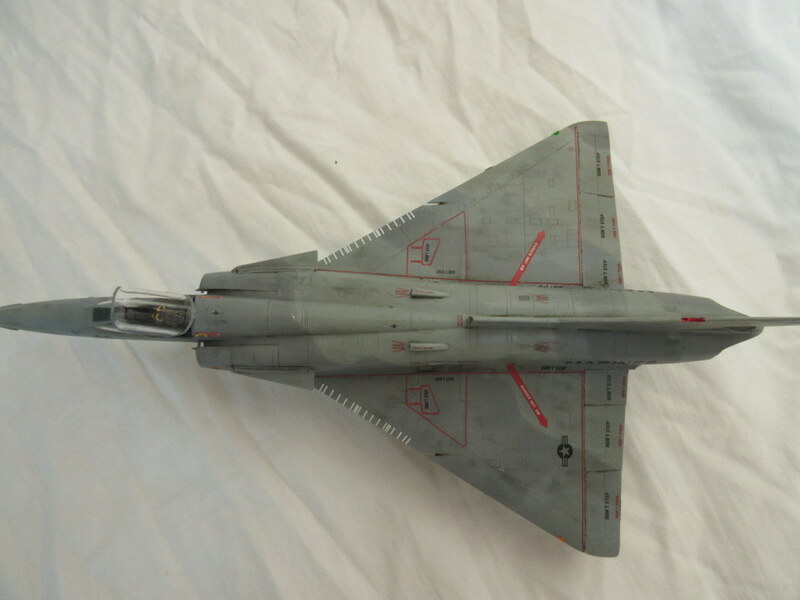 I built a 1/72 scale model of this back in the early 90s as I got back into the hobby (maybe only had a couple of kits in the stash then! ), so this was meaningful to me in that respect. I still have that old Testors kit, here they are together. 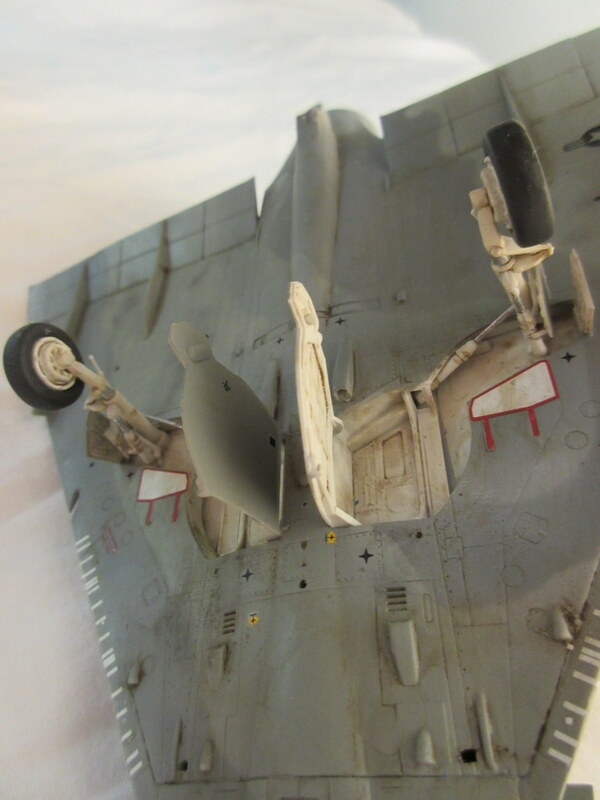 The engineering of the main landing gear was pretty complex. It took me a while and a few views of actual aircraft on the internet before I could figure out how the middle doors went on. A few more shots to close out. 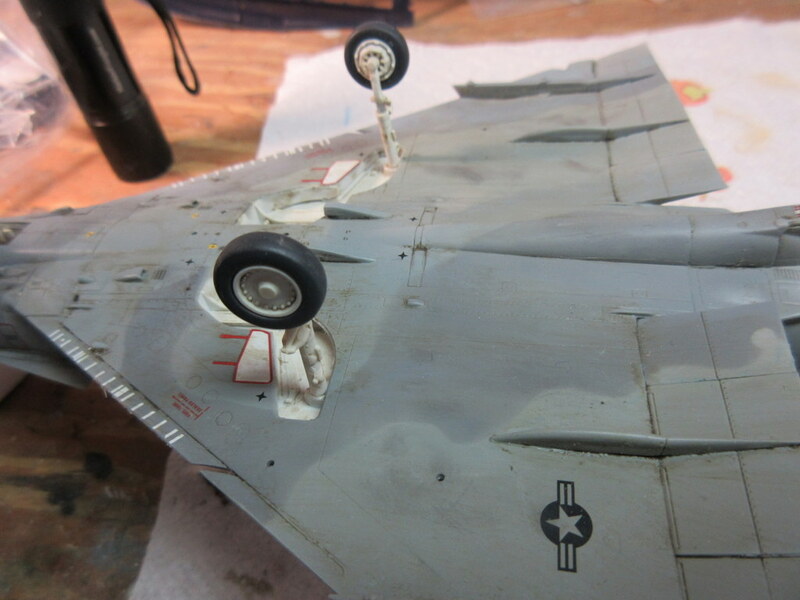 Decalling, subtle weathering, and overcoat be done. I took the tape off of the windshield and put the gear on her. I should be able to get the gear finished and gear doors on tomorrow night. 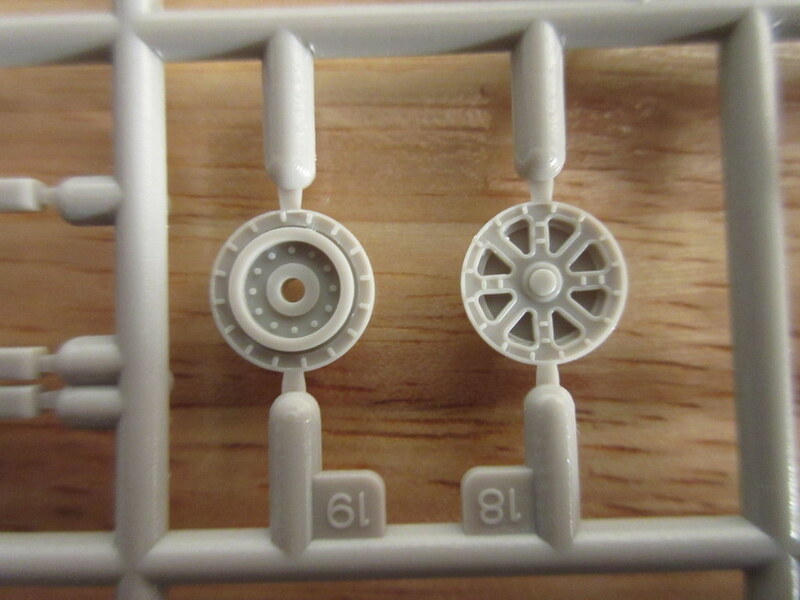 The kits comes with some very intricate gear parts. 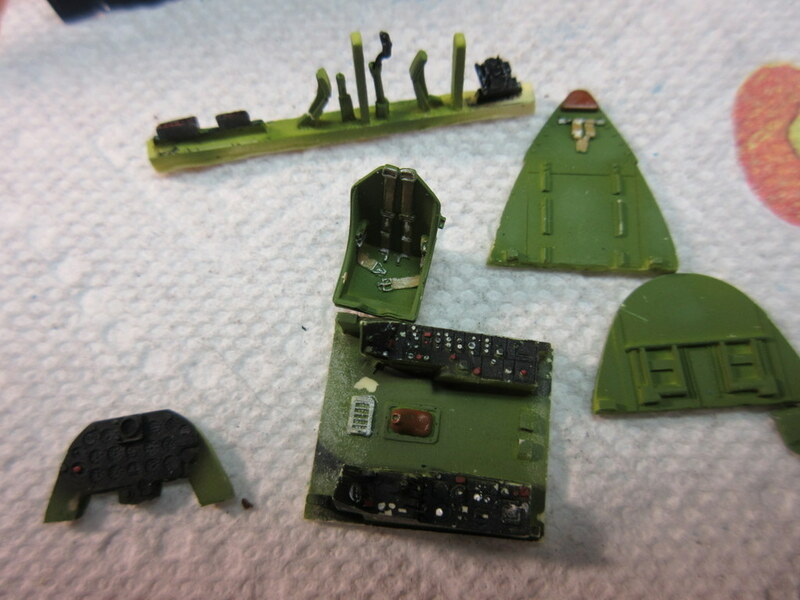 Finally I got the kingfisher insides ready for resin and I am starting gluing pieces together. 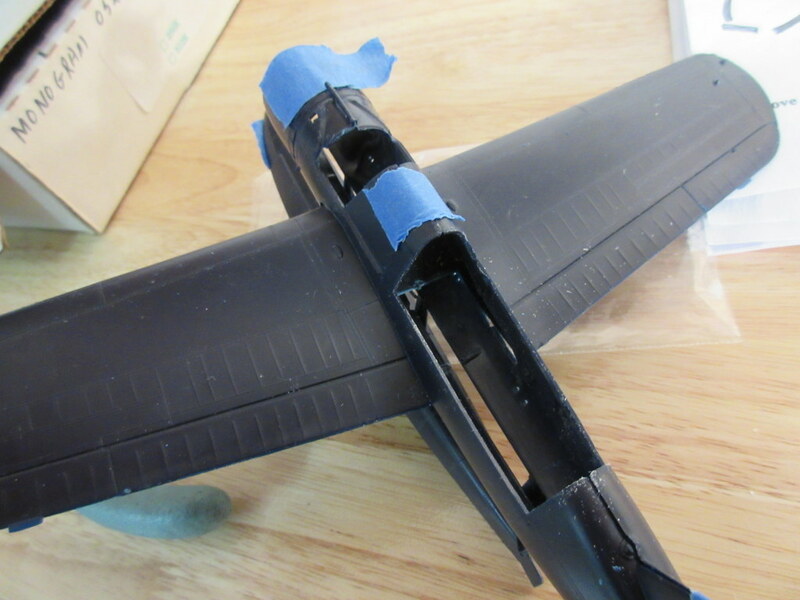 I had to split the lower wing and glue each half to the fuselage separately so I could start working on this without trying to add cockpit parts to a closed fuselage. 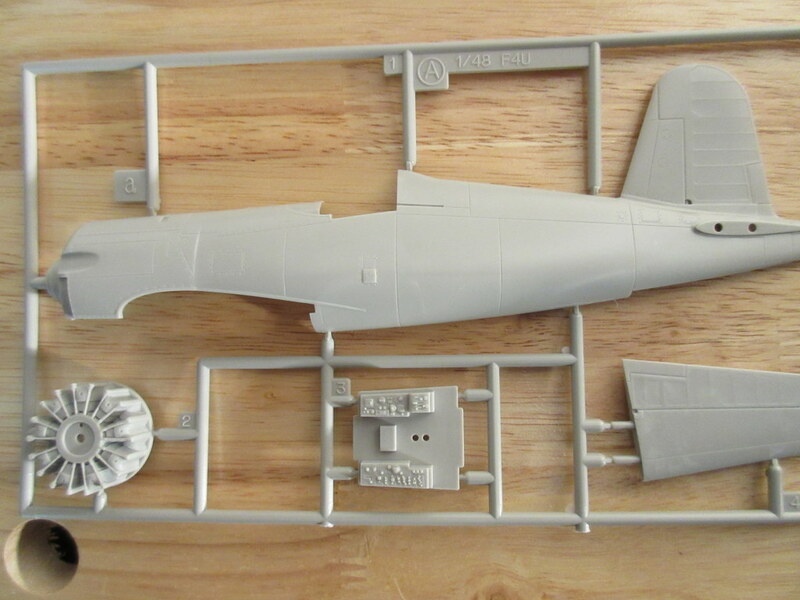 While I let the final coat of Future cure on my Kinetic F-21 and the milliput putty to harden on the Kingfisher I thought I’d open up the next kit I will add, a ProModeler F4U-5N. 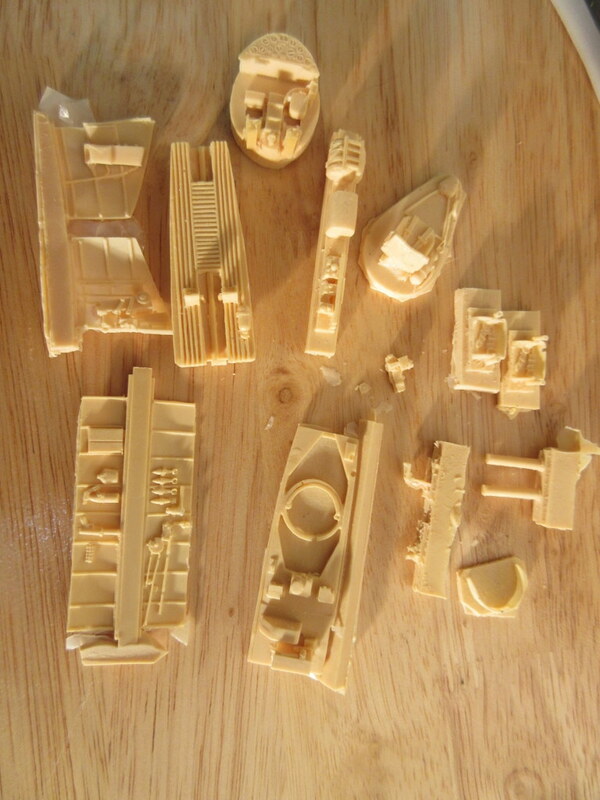 I’m not sure what set of molds these came from but they don’t look like Tamiya so I am assuming Hasegawa. 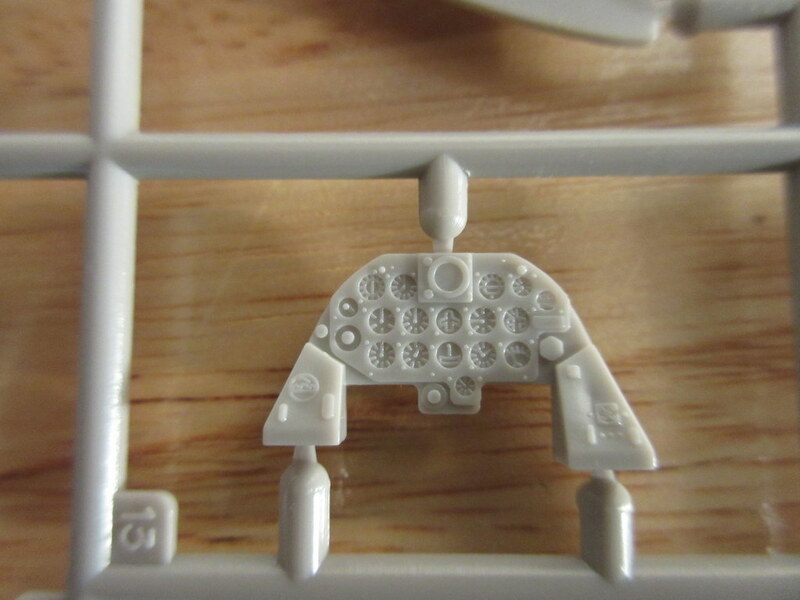 Out of the box the sprues look to have pretty nice detail and this should look good out of the box. 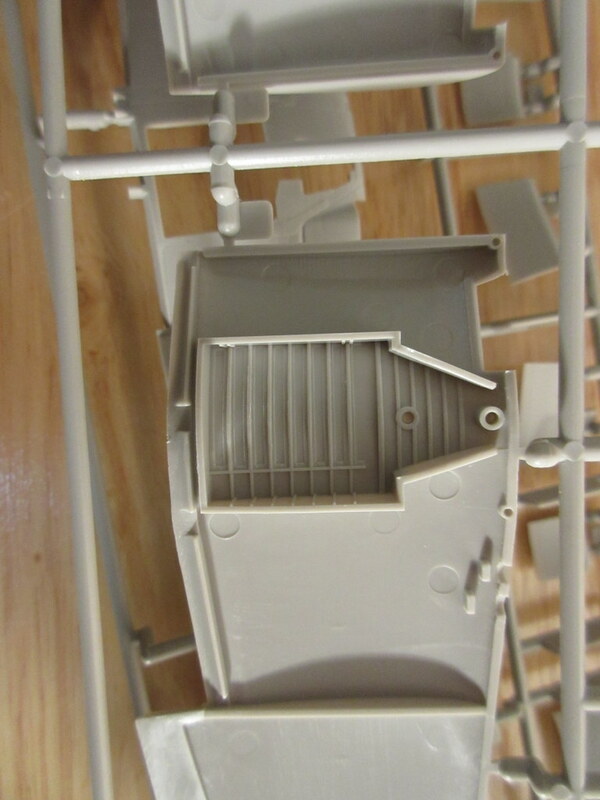 I plan to use the True Detail set for the cockpit, although the one on the kit doesn’t look too bad. 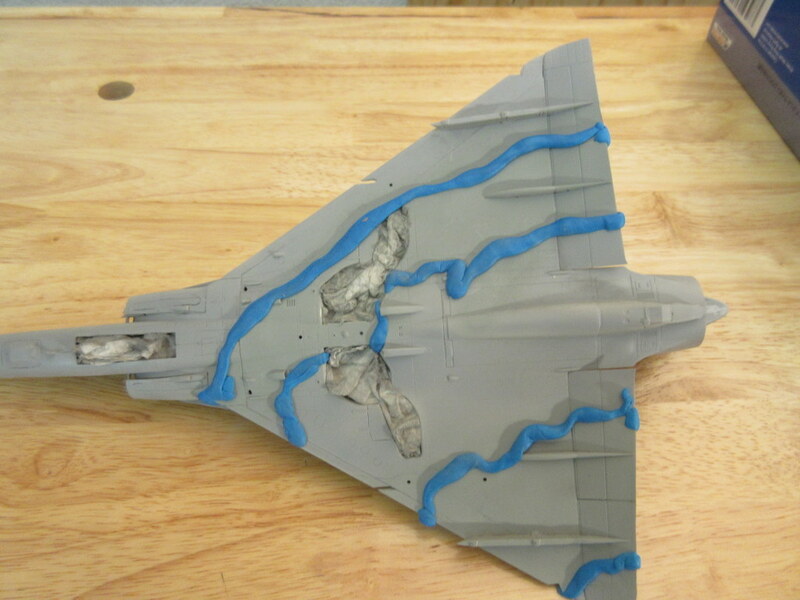 I plan on using the Aeromaster markings for an all black Marine nightfighter! 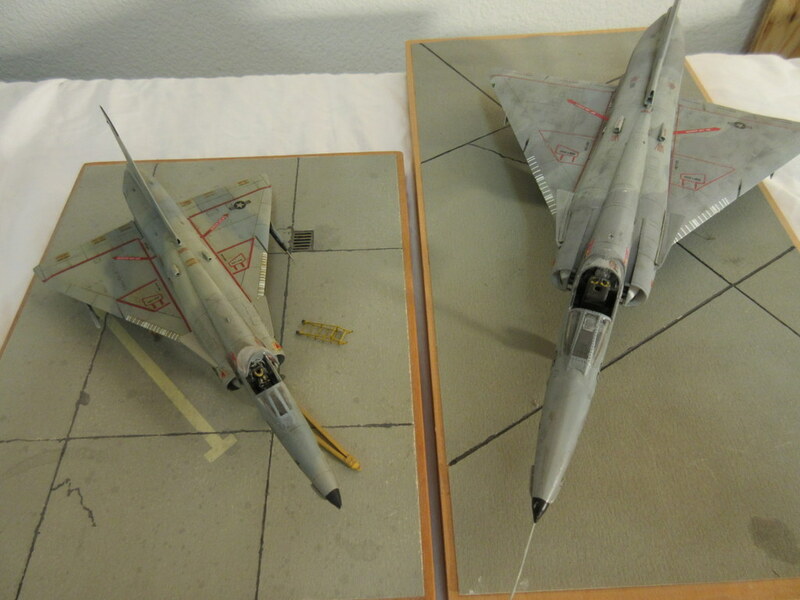 It will add another black aircraft to the collection. 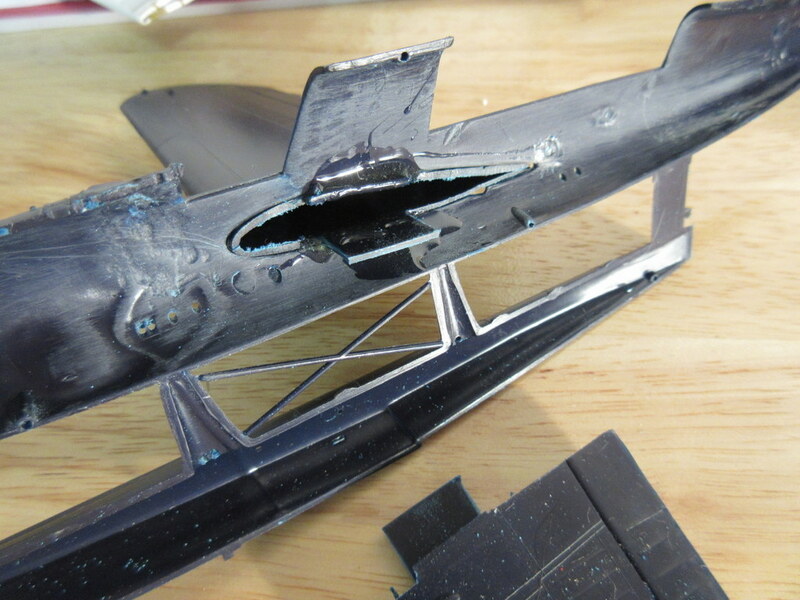 Was able to cut the wing of the kingfisher in half tonight and I am setting up the guide that will keep the other 1/2 of a wing in straight once I epoxy it in over the weekend. Looking forward to painting and putting resin into the cockpit. 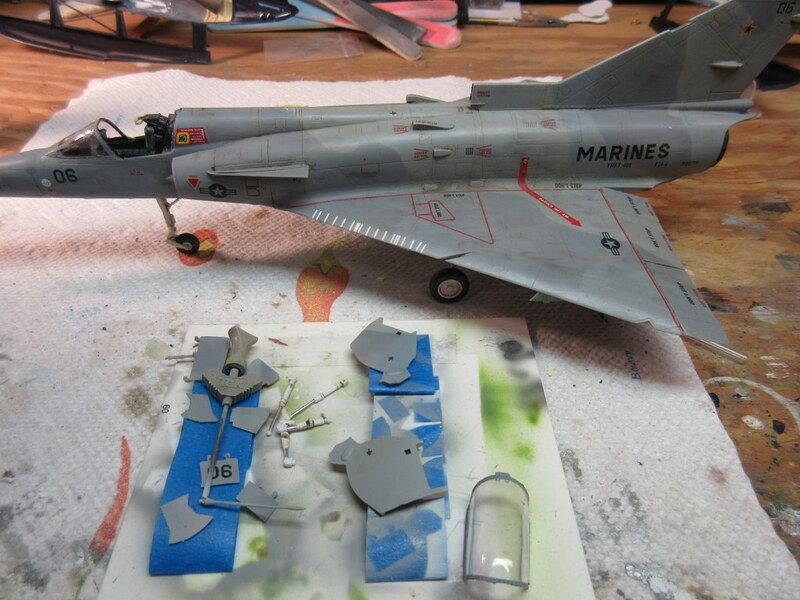 The Lone Star set looks really nice and it should look great once I get it into the kit and painted up. 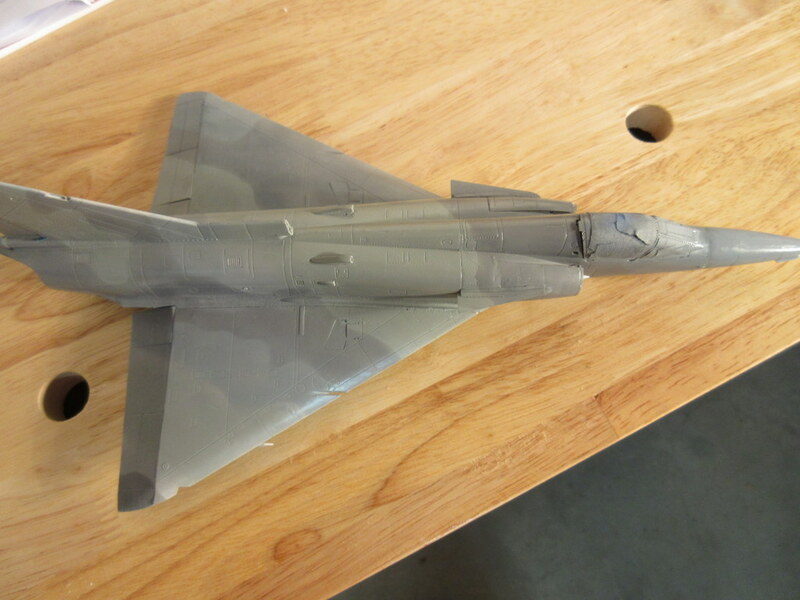 I also am making slow but gradual process on the F-21. 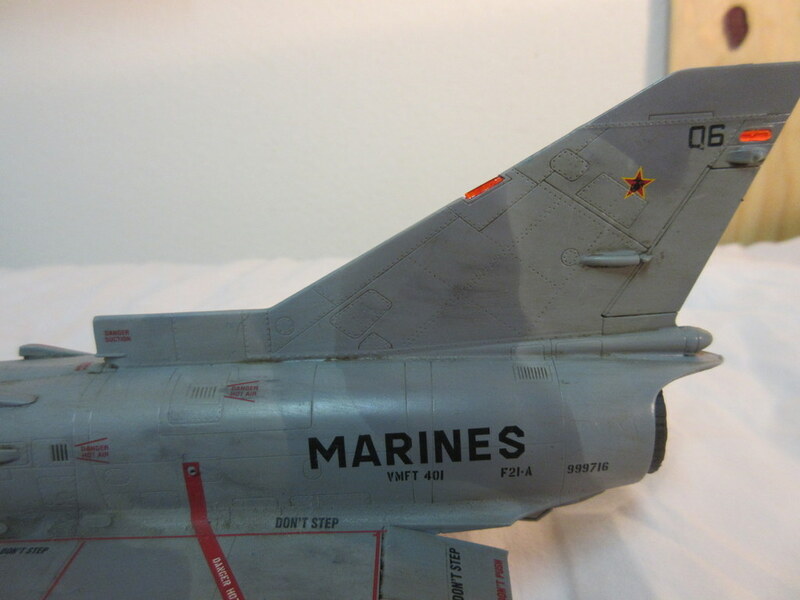 I am adding all of the stencils and the decal count on this goes up to 90 or so with some decals occurring in multiples. 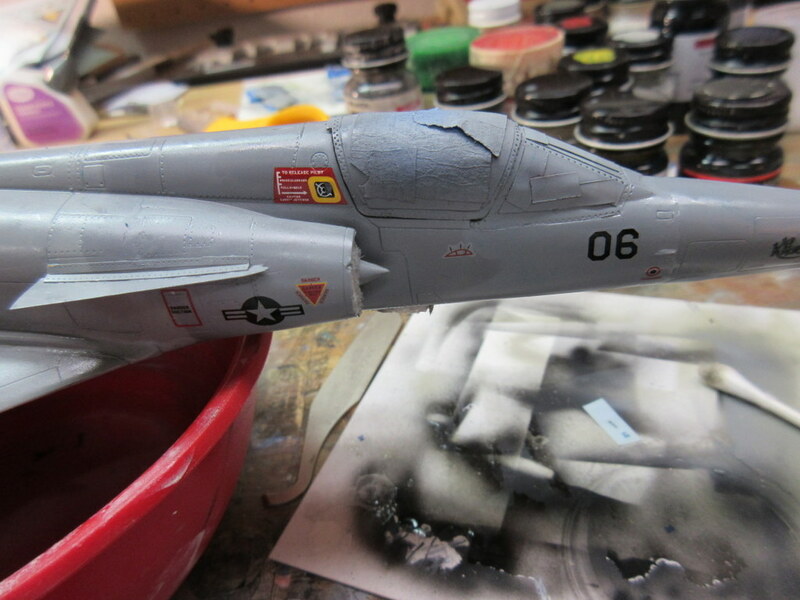 I’m up to 27 now after a couple of quick evenings of decaling. 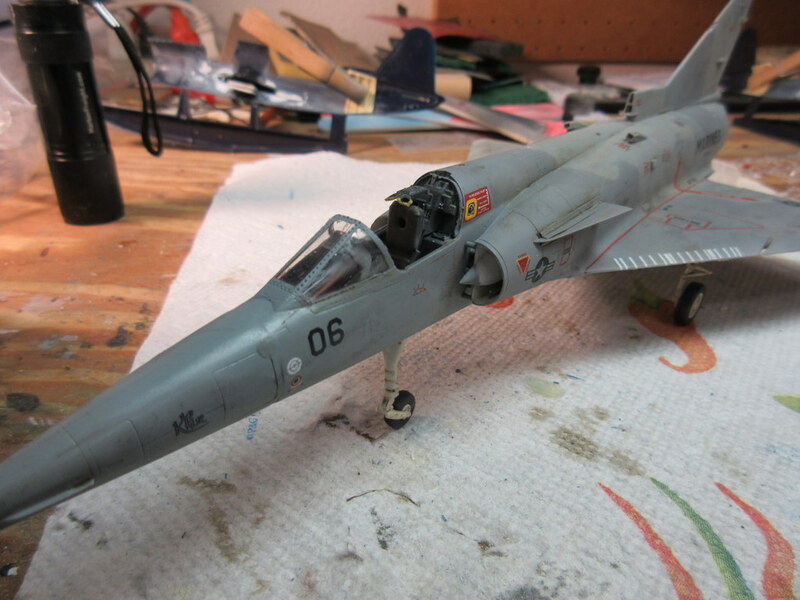 While I am starting to decal the F-21 I have started on the next build, an old Monogram Kingfisher. 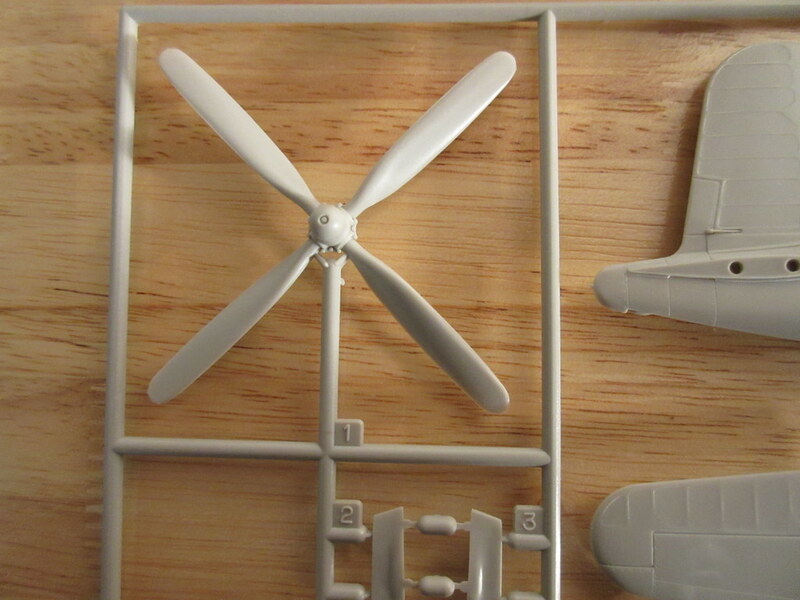 This kit comes out of a box I must have bought years ago; no kit box, no instructions, parts off sprue, etc. I’ve always had a fondness for this one as I am sure I built one back in the 60s. 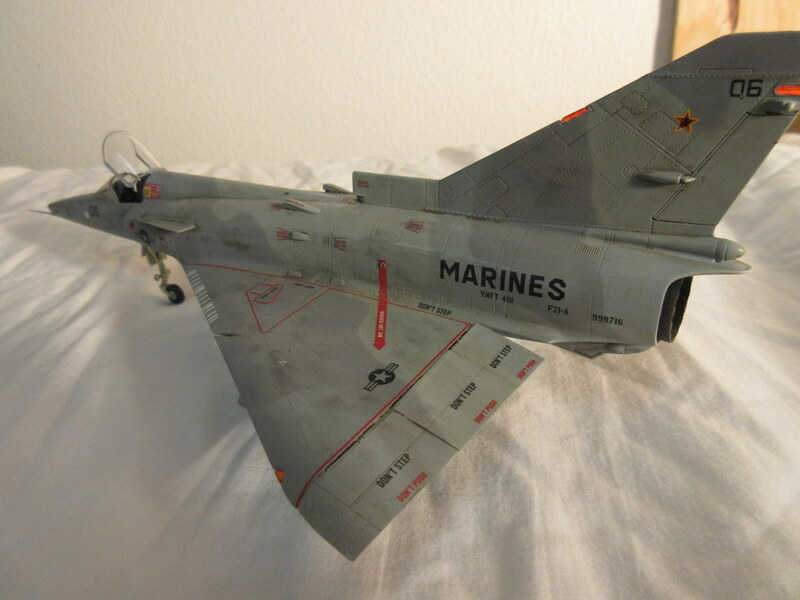 I built all of the blue and black plastic 1/48 Monogram Navy kits back then and this kit still has the black plastic parts, so I know its an original. The kit detail out of the box is actually pretty good. 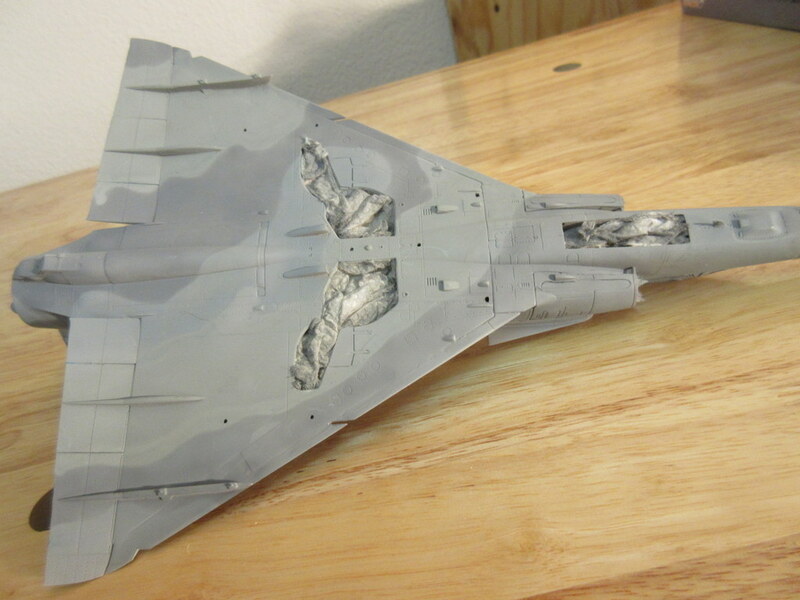 The raised panel lines are crisp and the detail isn’t over emphasized. 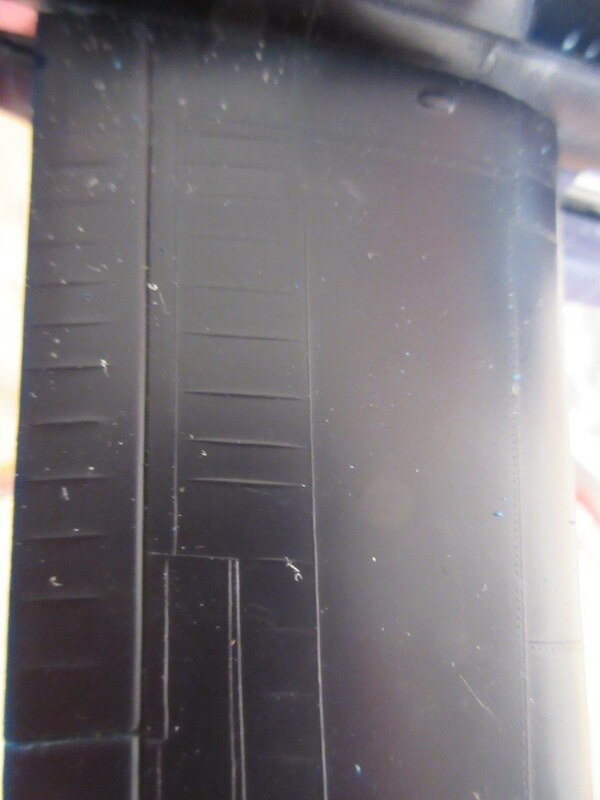 I was worried that from my memory many of these kits were rivet queens. 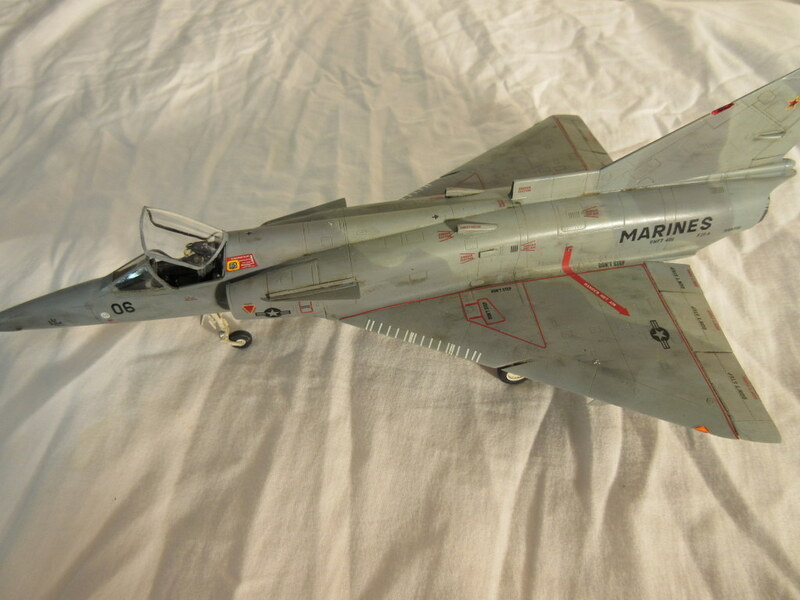 This one must have been one of Monograms later releases in this genre as it has pretty good detail and no working parts, and the pilot is actually in a cockpit instead of attached to a seat and all glued to a bulkhead. 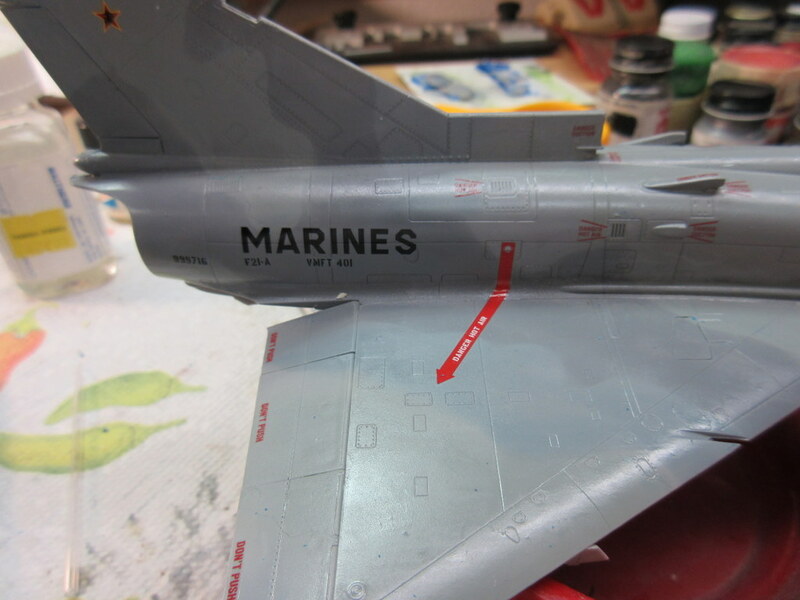 Here a show of the detail on the wing. 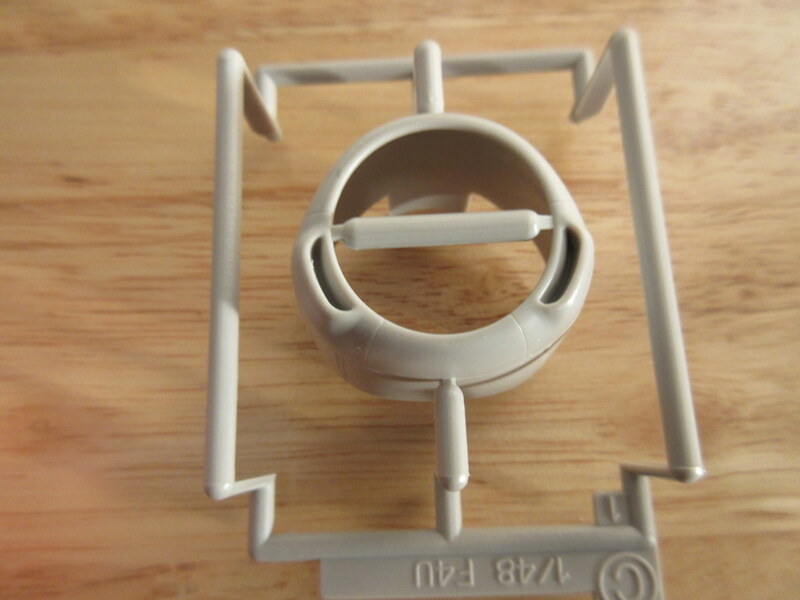 I am coupling this with the Lone Star Kingfisher cockpit resin. 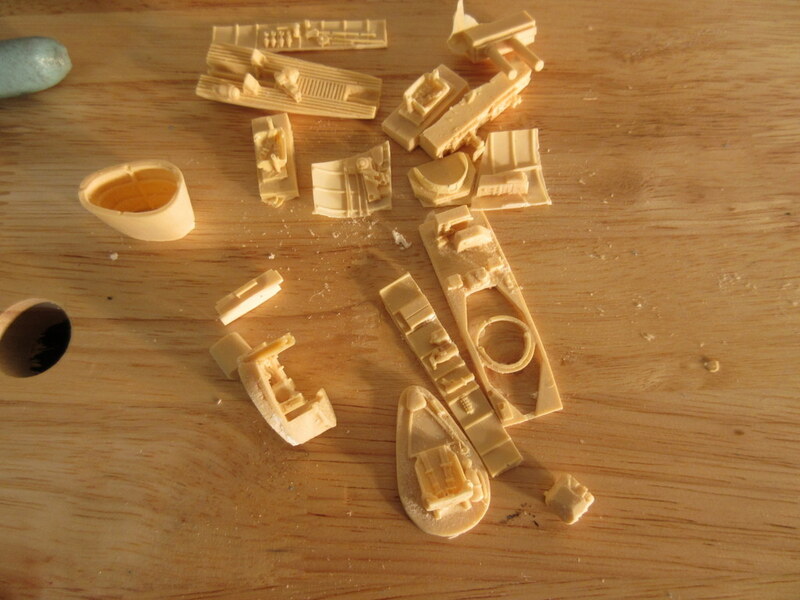 This is a great looking set out of the box, it has detailing for both of the front and rear sections. 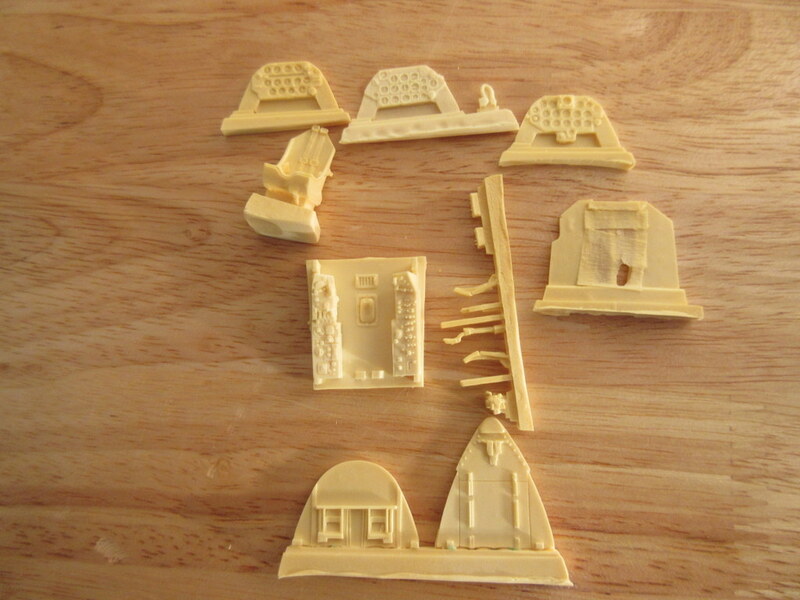 Here are some shots of that with the instructions before and after cleanup. 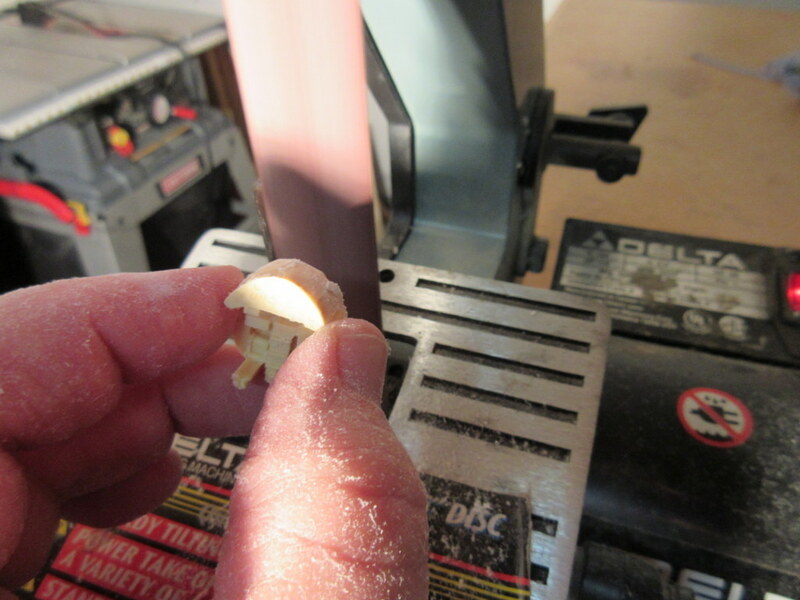 I like to use my trusty belt sander (with the shop vac running to pull resin dust) to clean up the parts quickly and keep the resin dust fairly contained. 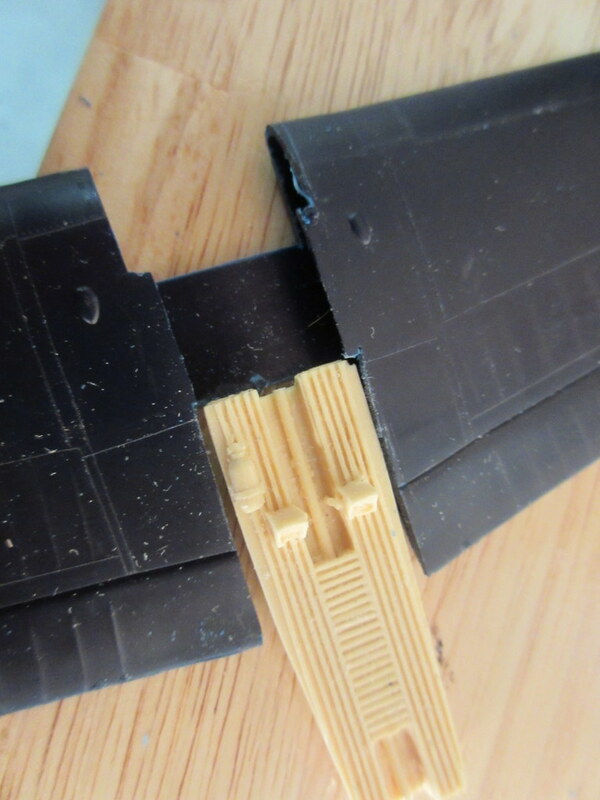 The only trouble with this kit’s setup is that the wing of the kit is connected through the fuselage, a one piece lower wing half; one wing goes into the fuselage from the inside, then you put the other 1/2 of the fuselage over the other 1/2 of the wing and glue the fuselage together. 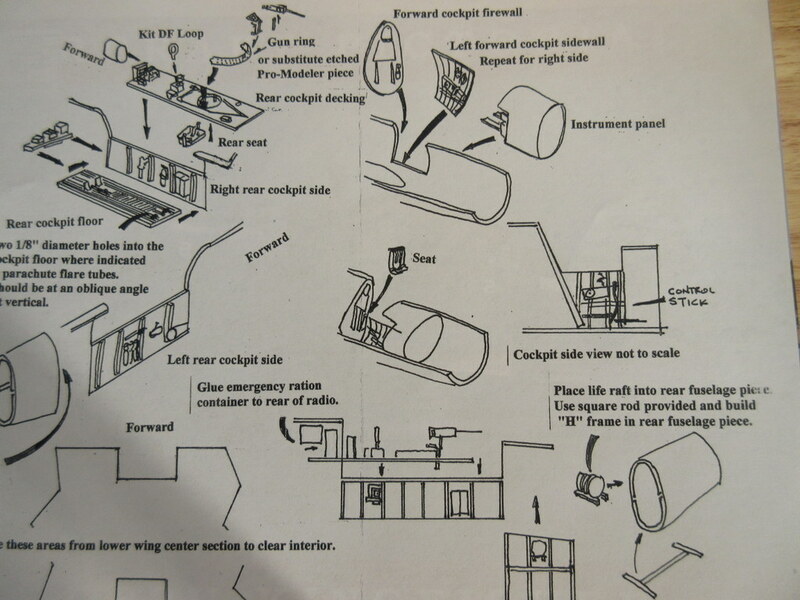 The Lone Start instructions show you where you have to cut away parts of the wing in order to make the bulkhead and the side panels of the cockpit fit. 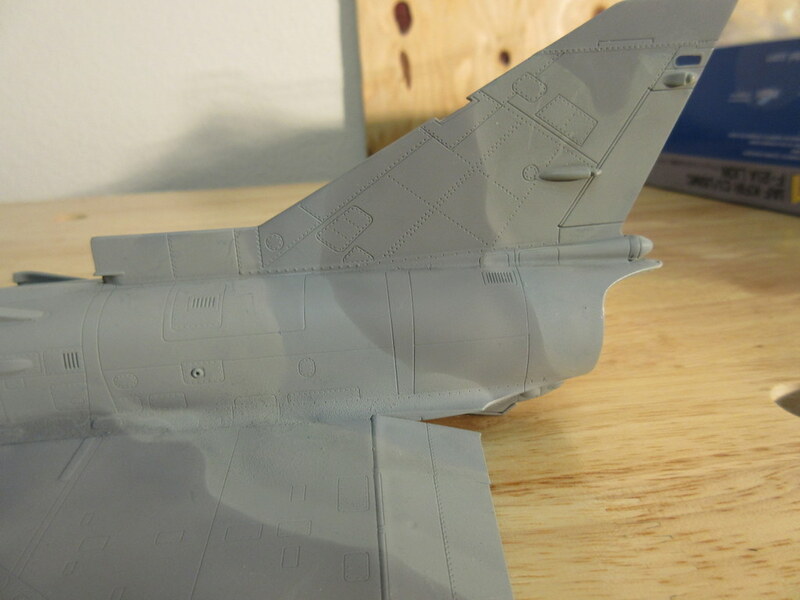 It looks like it will also make it pretty tough to paint and detail because the fuselage might have to be put together before you glue in the resin. 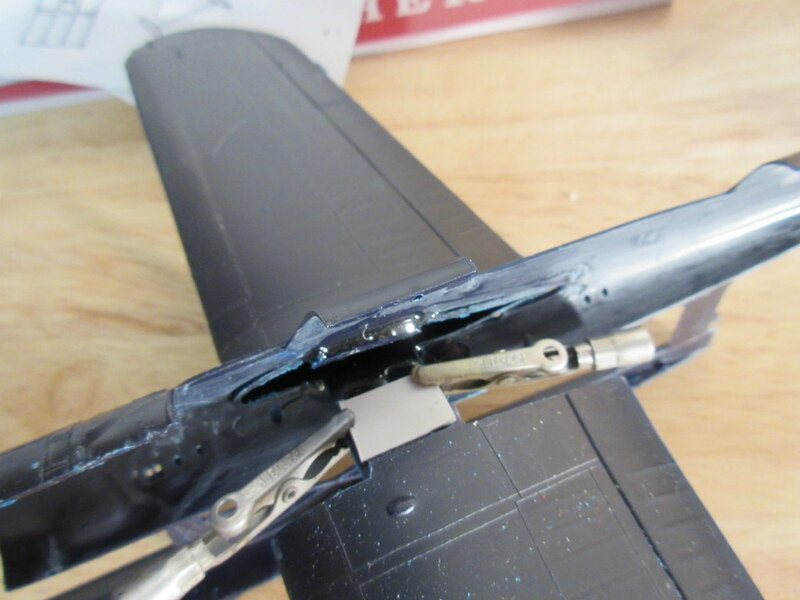 I have a plan to do some tricks where I will fix one of the wings to it’s fuselage side with epoxy, so the wing is at the right position, cut the wings apart, make a connector between the two wing halves so I can get them back together, and epoxy the other wing 1/2 to it’s fuselage. 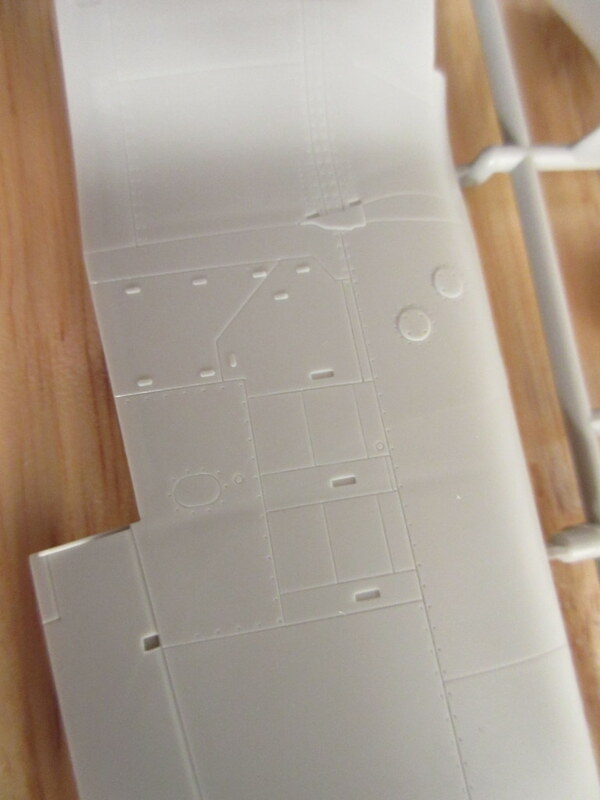 That way I can split the halves part and put the resin in and detail it. 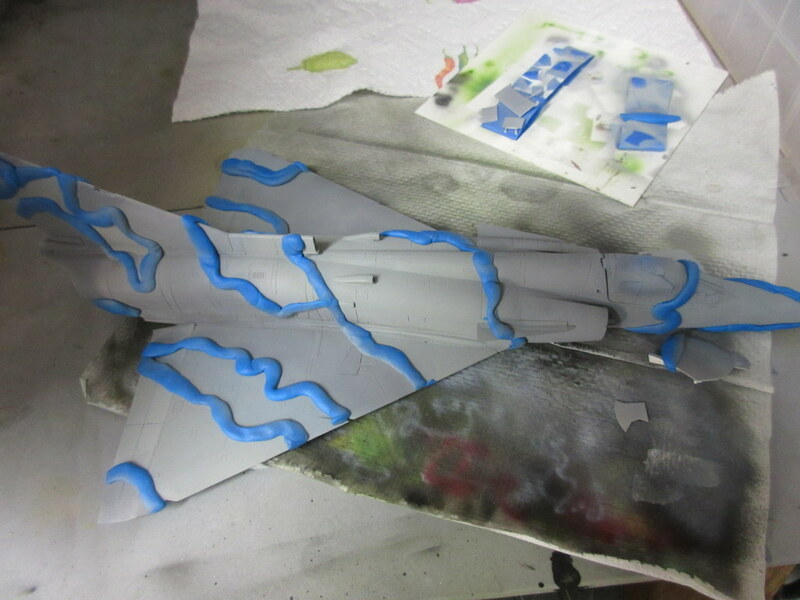 I have the first wing epoxied and we’ll get to the rest in ou next episode.